Allowing your customers to carry on accessing information about your business outside your usual opening hours can be essential. Make sure you don't miss out on an opportunity to promote your activities by investing in an Outdoor Leaflet Holder from UK POS. 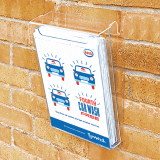 Designed to remain outside in all weathers, these leaflet dispensers can be attached to exterior walls with ease, making it simple for passing members of the public to find information on your company quickly and easily. UK POS' Outdoor Leaflet Dispensers are made from clear, high-impact acrylic and come with lids that close automatically to prevent the contents of the wall-mounted brochure holder from being exposed to the elements. Perfect for storing brochures, postcards, menus, general business information and many other types of literature, these acrylic brochure holders are there to promote your business and generate leads even when you're elsewhere. Outdoor Leaflet Holders come in a variety of models including A4 and A5 sizes, but don't worry if you can't find the correct size from UK POS - we're always happy to discuss the manufacture of custom orders. Just get in touch with a member of the team using our sales hotline to find out more.